In a small saucepan, whisk together the rice vinegar, water, soy sauce, agave nectar, canola oil, cornstarch, ginger and garlic. Bring to a boil over medium heat. Cook, whisking frequently, until the sauce has thickened, about 4 minutes. Let the sauce cool slightly, then transfer all but ¼ cup of the sauce to a shallow container, such as a glass baking dish. Reserve the ¼ cup sauce to serve with the cooked chicken tenders. Preheat the oven to 450 degrees F. Place a wire rack on a baking sheet lined with foil. Lightly coat with cooking spray. In another shallow container, stir together the panko breadcrumbs, parsley, Chinese 5-spice powder and salt. 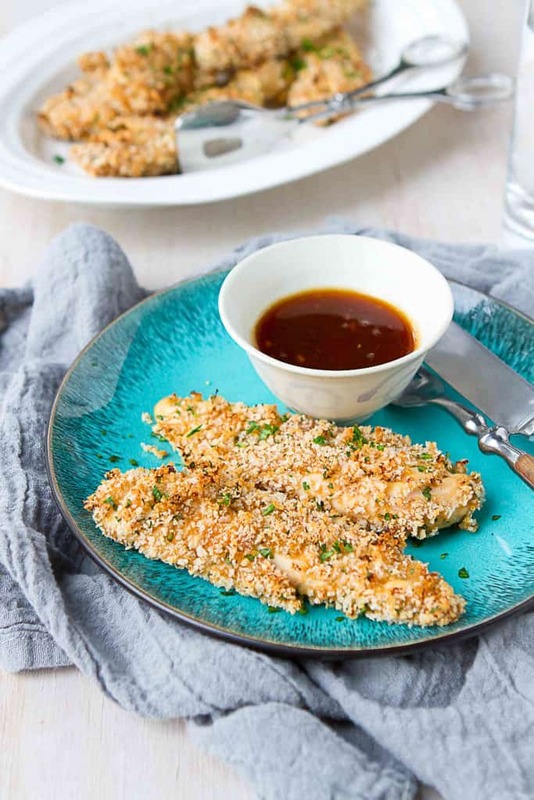 Working with one chicken tender at a time, dip the chicken in the teriyaki sauce, coating completely. Next, roll the chicken in the breadcrumb mixture, completely coating the outside. Transfer to the prepared baking rack. Repeat with the remaining chicken, sauce and breadcrumb mixture. Baked until the chicken is just cooked through and the breadcrumbs are starting to brown, turning halfway through, 5 to 6 minutes per side (total 10 to 12 minutes). Serve with the reserved teriyaki sauce. © 2019 Cookin Canuck. All rights reserved.